It's time to shine the spotlight on our beagle of the week, but first lets talk about some beagles (and other dogs) who could use homes. 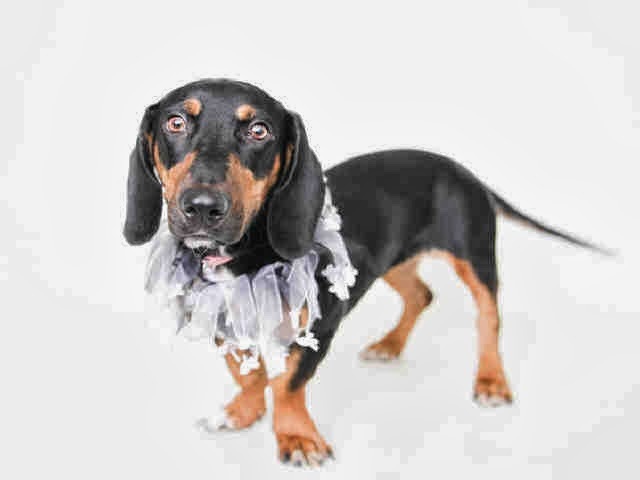 Orange County Animal Services in Orlando always has five pages of dogs for adoption. Many of them probably won't leave the shelter alive, sadly. They were at Petco last week with a few dogs, and they said they'd had only one adoption at the shelter all weekend. There are all kinds of dogs at Orange County Animal Services, not just pit bulls and labs, which seem to make up the populations of most Florida shelters. There are terriers, shih tzus, there's a bull terrier, catahoulas (we also see a lot of these at Florida shelters), huskies, a cane corso, a collier and TONS of chihuahuas, not to mention some really interesting mixes, because mother nature makes the best designer dogs! Here's Brenda. The shelter says she's a beagle mix (I suspect dachshund). She's 10 months old and needs to be out of the shelter by Saturday, Oct. 26. Her Animal ID is A277814. Here's Chopper. He's 9 years old, and probably could stand to lose a little weight at 42 pounds. His last day is Sunday, Oct. 27. And the shelter is NOT open on Sundays. His Animal ID A277888. 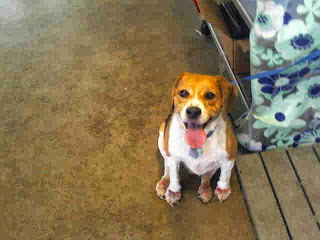 Please go to Orange County Animal Services and check out Brenda, Chopper and the rest of the dogs, cats and a bunny too! The shelter is open six days a week. The shelter is at 2769 Conroy Rd., Orlando, FL (near Mall at Millenia). The phone number is (407)254-9140. "My beagle is named Tommy Trojan (he is a USC fan). Tommy joined our family in 2006 as a result of a visit to a pet store in Bloomington, IN. Tommy had a tough start -- at 18 months he almost died due to a hernia problem. He had a bowel resection and spent 6 days in the hospital. I spent every moment I could with him. "Tommy has "step-dogs," Addie (shepherd/lab mix) and Mo (a chocolate lab). His favorite foods are bacon bits and cheese. Tommy is a cuddly boy. He likes to sniff everything, especially ears and eyes. Tommy also enjoys a good bark and thankfully never learned to howl. He isn't a special dog in any way, other than being the best friend in the world. "The best part about owning a beagle is their personality and devotion to their humans. My Tommy is a carbon copy of Snoopy. He even sleeps on top of his crate. The hard part about owning a beagle is training. Stubborn dogs! However I wouldn't have it any other way." Got a special pup you'd like to be beagle of the week? Drop me a line on the Life With Beagle Facebook page! I hope they find there forever homes soon. Will share. Brenda and Chopper are adorable. Paws crossed that they find their forever homes. Sharing. Such cuties, have shared both of them!